The YnFx has been constantly striving to create the basic information infrastructure for the textile community over the past several years. In this attempt, we have been preparing several in-depth analytical reports on various fibre chains compassing the global trends. These reports are designed keeping in mind the requirements of CEOs and the management team and those striving to take informed decisions. In the past, we had published three value chain reports. These reports were well received by users and found them to be of great value in their business planning and corporate development. Continuing with our efforts to serve you better, we pleased to release this edition of the ‘Acrylic Chain Report: 2012”. This “Acrylic Chain Report: 2012” containing over 81 pages provides a comprehensive review of market trends, drivers, issues, and challenges. It is richly annotated with authoritative and unbiased objective description, and hard-to-find statistical facts. The report also provides unequivocal views on future potential while throwing light on the prevailing climate in key regional markets and projections upto 2014 for Acrylic. Major investments and capacity shut down are captured extensively. Processes description, end use and derivatives along with the latest producer-wise capacity are added feature of this report. In this report we have attempted to bring to the user country wise import/export trade statistics on the further downstream segment like acrylic spun yarns and woven fabric of acrylic for the years 2010 and 2011. The electronic version is available for Euro 500 or equivalent in other currency. Hard copy is available on request with printing and postage charges extra. 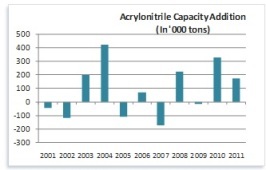 Acrylonitrile capacity stood at 6.8 million tons in 2011, 74,000 tons more from last year. All of this has come up in Asian region shared between China and Taiwan. With this, Asia now controls more than 50% of global acrylonitrile capacity. In 2011 acrylic fibers accounted for only 38% of total acrylonitrile consumption, down from 43% in 2007 and nearly 48% in 2004. Acrylic fibers have been experiencing strong inter fiber competition, especially from polyester fibers. In the United States, acrylic fiber production stopped in 2005, and in Europe it has been declining for many years. Both these regions have been suffering under increasing competition from Asian imports of both fibers and finished goods. During 2008 a large drop in demand for acrylic fibers was also registered in Asia. Although some recovery has been seen since 2009, demand for this end use is expected to improve only gradually. Acrylic fibre demand in Asia levelled off in 2011. Falling prices look to be holding back purchases. Acrylic fibre import prices to China and elsewhere in Asia fell. China domestic acrylic fibre prices have also moved a bit lower. Acrylic fibre demand for producers in Europe/Turkey remains reasonable. Production rates remained also flat as fibre prices moved down end of the year. US import prices for November saw a further reduction.